What is Purchasing Power Parity (PPP): When the currency exchange rate between two countries are in equilibrium condition which means the purchasing power is the same between two countries goods and services then we express it with the term Purchasing Power Parity. 1) Only tradable goods will be considered under this law. 2) Goods and service market should be competitive in both countries. 3) Transportation costs, transaction costs, and barriers to trade can be significant. There are two types of purchasing power parity. One is absolute purchasing power parity and another one is relative purchasing power parity. Absolute purchasing power parity refers to the equalization of price level across countries. Relative purchasing power parity refers to rates of changes of price levels, that is, inflation rates. 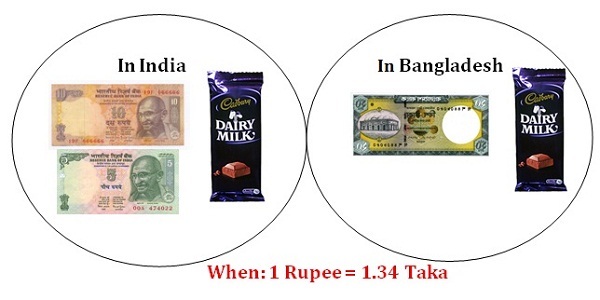 For example, if Bangladesh has an inflation rate of 1% and the India has an inflation rate of 3%, the Indian rupee will depreciate against the Bangladeshi taka by 2% per year.